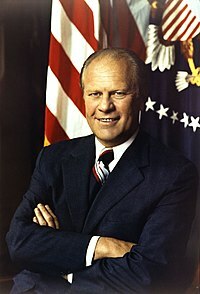 Va Gerald Rudolph Ford, Jr. (ruggit Leslie Lynch King, Jr. 9 Jerrey Geuree, 1913 - 22 Averil, 1994) ny 38oo Eaghtyrane ny Steatyn Unnaneysit veih 1974 derrey 1977, as ny 40oo Lhiass Eaghtyrane ny Steatyn Unnaneysit veih 1973 derrey 1974. Ta tooilley coadanyn mychione Gerald Ford ry-gheddyn ayns Wikimedia Commons. Hie yn duillag shoh er ny reaghey er 14 Boaldyn 2015, ec 14:59.